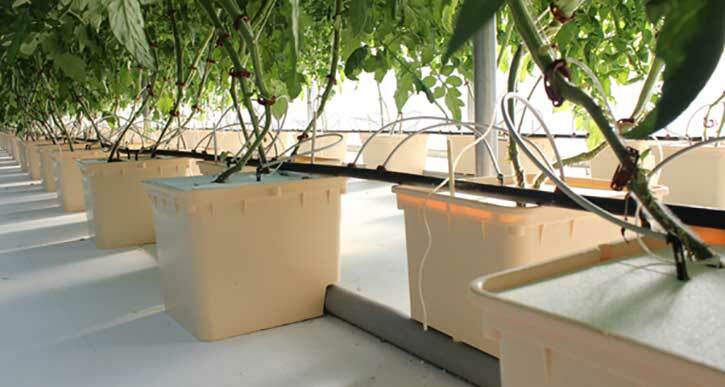 Dutch Bucket System is optimized for large, vining crops, such as tomatoes, cucumbers, eggplants, and peppers. The system includes 2.9 gallon (11 liter) Bato buckets which measure 12"- long, 10"-wide, and 9"-high. Typically the buckets are staggered on 16"-centers along a center 2.5" PVC drainline, though the versatility of the buckets allows for modified configurations. The buckets are injection molded with a UV stabilized polyethylene material resulting in a highly durable product with smooth edges and surfaces. The Bato bucket is sold with a two-piece elbow which connects the base of the bucket to the drainline; through this channel excess nutrient solution can drain off while preventing root growth from clogging the drain line. The Dutch buckets are typically filled with perlite growing media, and crops are transplanted into the buckets after maturing for 2-4 weeks in a primary growing media, such as a 1.5" rockwool cube. The plants are fertilized using the Nutrient Injection System, which pulls a concentrated nutrient solution from fertilizer tanks at predetermined ratios and then injects the nutrient solution through the feed plumbing lines on intervals ranging from 3 minutes ON every 20 minutes to 1 minute ON every 30 minutes, depending on the season and maturity of the crop. Feed plumbing for the Bato Bucket System includes 0.5" poly pipe feed line reduced to 5/3 mm feed tube using 0.5 gpm emitters, and finally barbed stakes connected to the 5/3 mm feed tube anchor the feed line to the growing media. The 10 Bucket Bato System is great for growing vine crops and other tall growing plants. Suitable for tomatoes, cucumbers, peppers, squash, and many other fast growing fruiting and flowering plants. The Bato Bucket is formed with a small reservoir to avoid drowning or starving your plants, and are made from high quality UV resistant plastic. This system will provide you with fresh veggies for years to come! 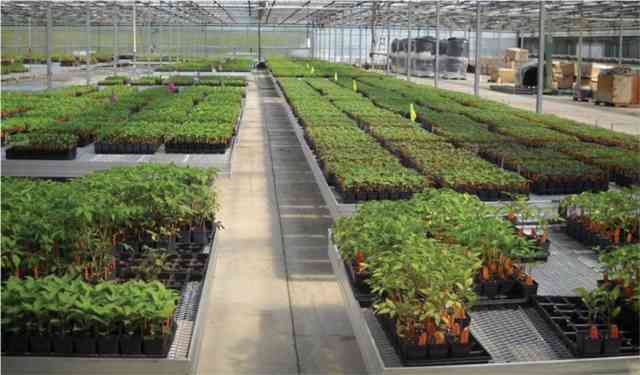 A minimum greenhouse footprint of approximately 12 feet by 20 feet will be needed to access all sides of the plants.